The majority of monkeys transported for research are long-tailed macaques who have resided on Mauritius for over 400 years when they were brought over by Portuguese sailors. 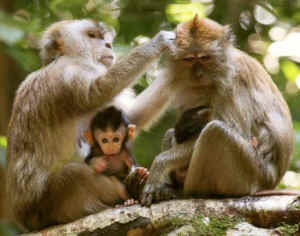 In high demand by the American and European research industries, more than 10,000 macaques priced at $4,000 each are exported from Mauritius each year. Air France is the main commercial airline responsible for the transport. 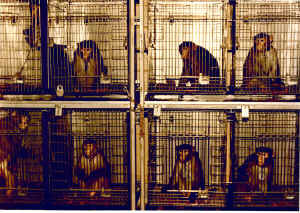 Hired by trapping and breeding companies in Mauritius such as Noveprim, Ltd. and Bioculture Mauritius, Ltd., trappers kidnap and split these highly intelligent and social monkeys from their families by luring them into cages baited with sugar cane and bananas during the winter when it is more difficult to find food. The monkeys are then kept in large breeding facilities before they are exported to research facilities in the US, UK, Spain and France. Behind the confines of testing facilities, monkeys are victims of torment, torture and inhumane procedures, facing horrors such as mutilation, poisoning, food deprivation, imposed infections from painful diseases, drug addiction and psychological torment. 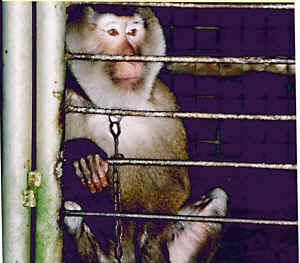 Driven mentally ill by the stress and terror of being locked in barren steel cages, many monkeys are known to exhibit behavior of spinning and rocking incessantly, ripping out their hair and biting into their own flesh. On May 23rd 2013, LCA's second billboard went up on the heavily trafficked Sunset Boulevard in the Silverlake area of Los Angeles. 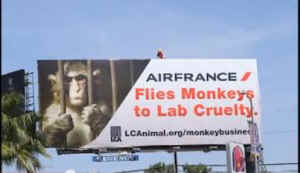 The billboard is stylized with graffiti with the Air of Air France crossed out and replaced with the word Scare.